Once an entertaining hypothetical, Sony’s answer to the NES Classic is now an actual retro gaming console due out before the end of the year. Here’s a perfectly reasonable list of games and features that could help make the PlayStation Classic a more enjoyable and authentic experience. That’s not a “royal” we. When I say “the games we want to play,” I’m talking about all of us. Right now we only know five out of the twenty games being included in the $100 PS Classic — Final Fantasy VII, Jumping Flash, Ridge Racer Type 4, Tekken 3, and Wild Arms. Until we get an official list from Sony, the remaining 15 games are comprised of the hopes and dreams of PlayStation fans everywhere. Final Fantasy IX: To be honest, I won’t even play it, but I want it. I know the adventures of Vivi and friends by heart. I’d give up a spot just to see that cover art on the home screen. Chrono Cross: If I don’t put the sequel to Chrono Trigger here, I’d do something stupid like Legend of Dragoon instead. No one wants that. Tony Hawk’s Pro Skater: So here I am, growing older all the time. Looking older all the time. Feeling younger in my mind. Metal Gear Solid: A true classic. If I didn’t include it here, Heather Alexandra would kill me. Ape Escape: Not so much a hope/dream as it is a near certainty. Sony-developed platformer, cute characters, monkeys — it’s a shoe-in. Tomba! : The classic tale of feral pink-haired boy versus evil pigs needs to be preserved. Like bacon. This screenshot is for Blade for the PlayStation, a game no one wants on the PlayStation Classic. Not even sure why this is here. Huh. Jet Moto: The original PlayStation was the machine for futuristic hover racing. WipeOut XL: The original PlayStation was the machine for futuristic hover racing. You can still buy PSX memory cards on Amazon. This one is $4.99, or $0.01 used. An original PlayStation is not a PlayStation without a memory card sticking out of the front. I’m not saying we need actual memory cards to save our emulated games; that would be silly. I’m just saying the system should require little memory card-shaped USB dongles in order for games to play properly. How many gamers in the late ‘90s brought home a shiny new PlayStation only to discover that a vital component of stress-free enjoyment of lengthy games like Final Fantasy VII was not inside the box? Certainly not just me. If Sony can recreate the thrill of running to Walmart in the middle of the night after playing FFVII for 20 hours without saving, they’ve got my money. More of my money. Why don’t those controllers have analog sticks? The original PSX didn’t get dual analog sticks until 1997. If Sony were to give those to us immediately, it would sour the experience. Wait a couple of years, then charge us $50 apiece. Actually larger than the original. Thanks a lot, Photoshop. 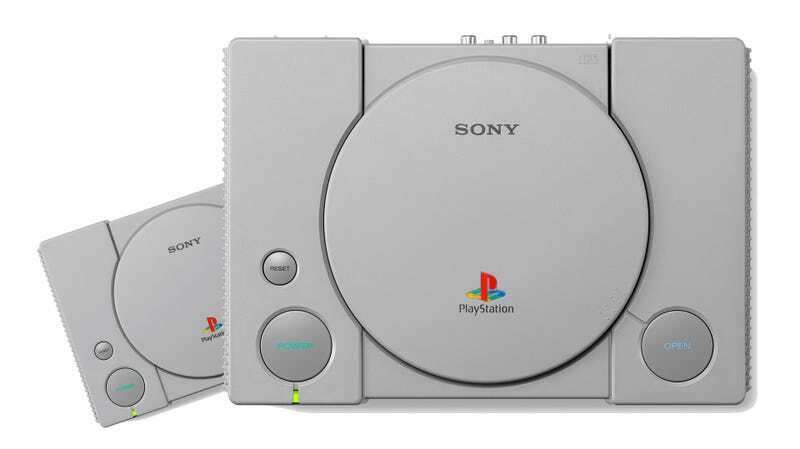 The smaller, curvier PS One made the blocky PSX look like a poorly-designed movie prop from a ‘70s B-movie. Toss in a miniature LCD screen that clips on the top and it’s a PlayStation Portable people will actually buy. Hackers cracked the NES and SNES Classics within days of their release. Is one of the most hackable consoles of all time going to be any different? Sony can get out in front of the modding scene by packaging their own tiny mod chips, unlocking the ability to run perfectly legitimate game backups before everyone does it for free. As perfectly reasonable as most of my suggestions may be, I understand that Sony might not have the time or inclination to implement them all, let alone your own suggestions. You know what, share them with us anyway. Couldn’t hurt.